Download "Monopoly. 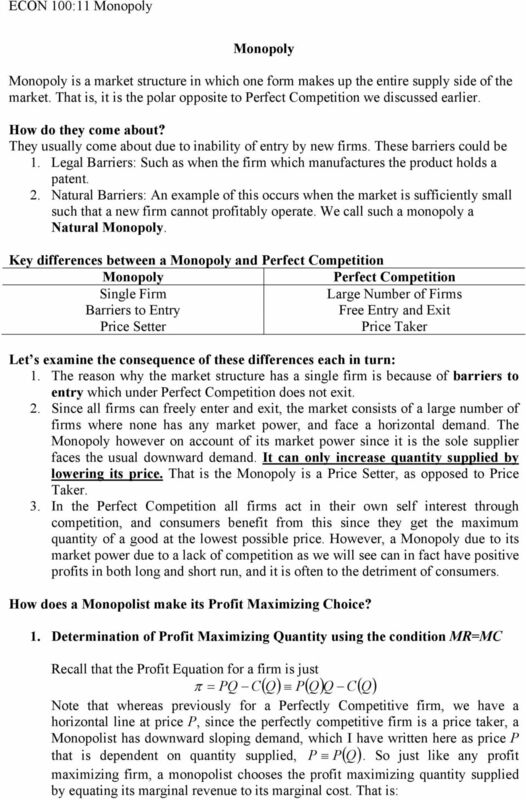 Key differences between a Monopoly and Perfect Competition Perfect Competition"
2 maxπ = max ( ) d + d MR = ( ) C( ) ( ) dc = ( ) The right hand side of the condition tells us that the monopolist has to consider the fact the demand for its good is downward sloping, i.e. it can increase quantity sold by reducing prices. 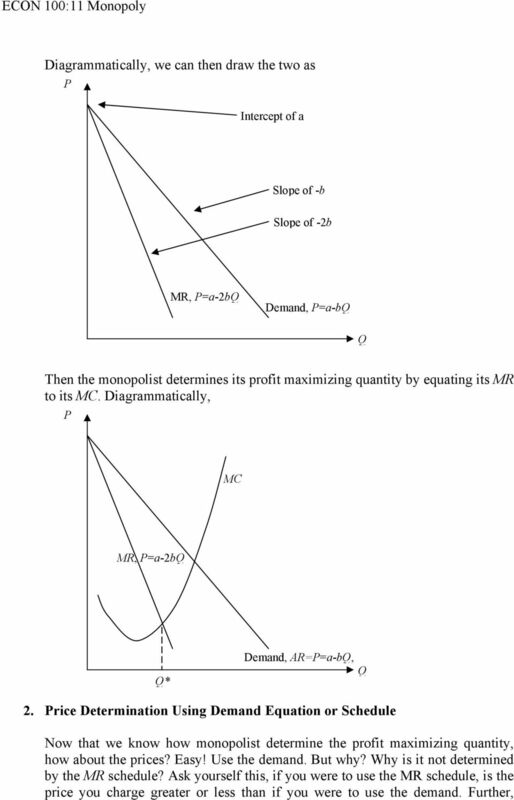 Note from the condition that d( ) + ( ) < ( ) d d( ) Where is just the slope of the demand schedule of the monopolist. Since d we know that the slope of the demand is negative, this means the marginal revenue curve is always below the demand. Matter of fact, assuming the linear demand that we have been using, there is a strict relationship. Let us assume a general demand = a b where both a and b are positive numbers. 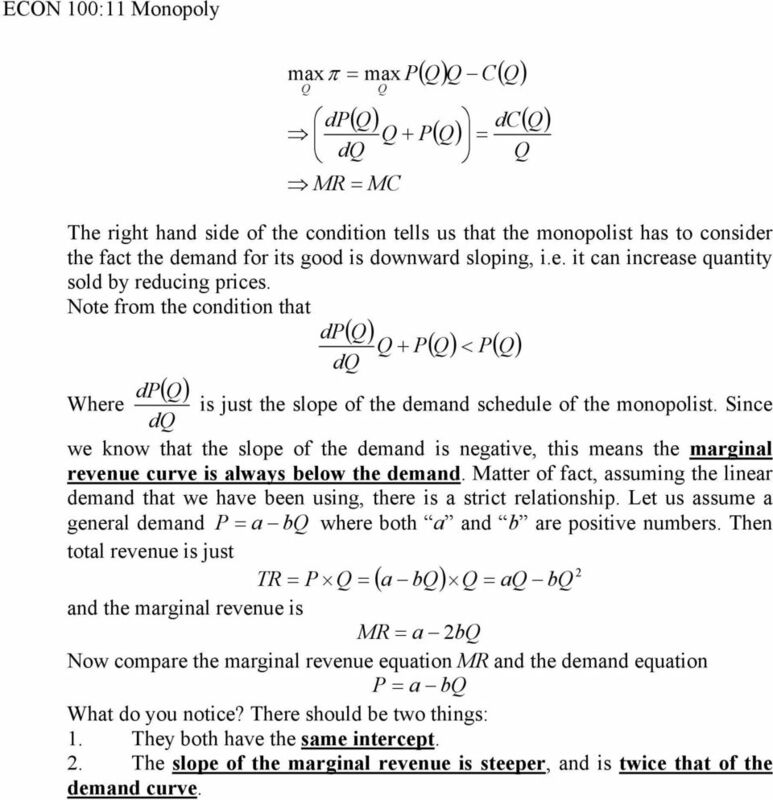 Then total revenue is just 2 TR = = ( a b) = a b and the marginal revenue is MR = a 2b Now compare the marginal revenue equation MR and the demand equation = a b What do you notice? There should be two things: 1. They both have the same intercept. 2. The slope of the marginal revenue is steeper, and is twice that of the demand curve. 4 conceptually, what consumers are willing to pay are reflected by the demand, not the marginal revenue schedule. 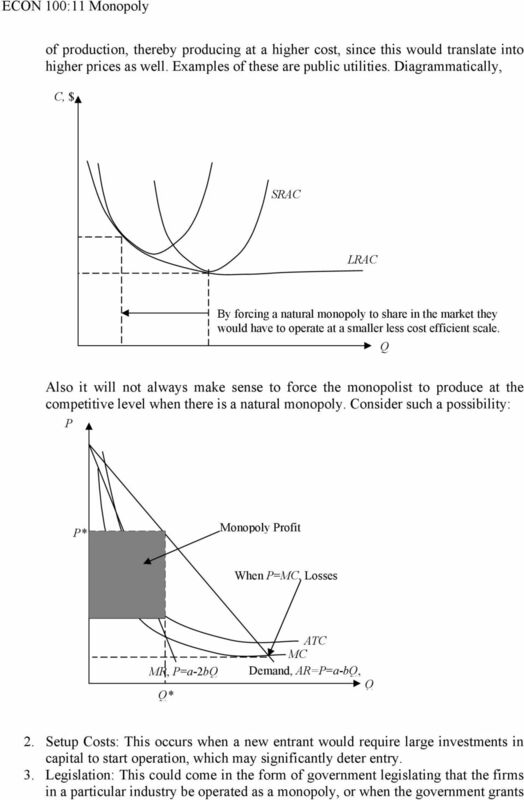 Further, the monopolist s supply or its is the industry s supply, while for a perfectly competitive industry the supply is the horizontal summation of all the supply or curves. 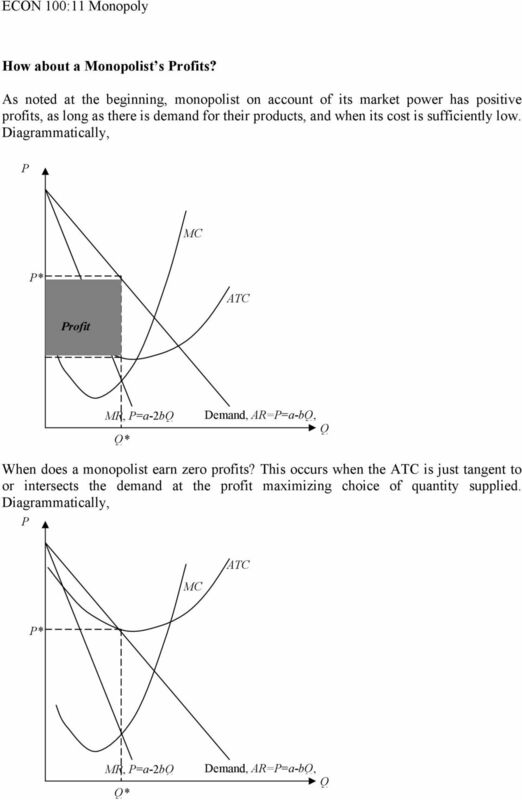 Diagrammatically, * C MR, =a-2b * C Demand, AR==a-b, So what is the significance? Have a close look, and recall that a firm under perfect competition chooses price and quantity such that =. The price noted about is C, and it is lower than *. 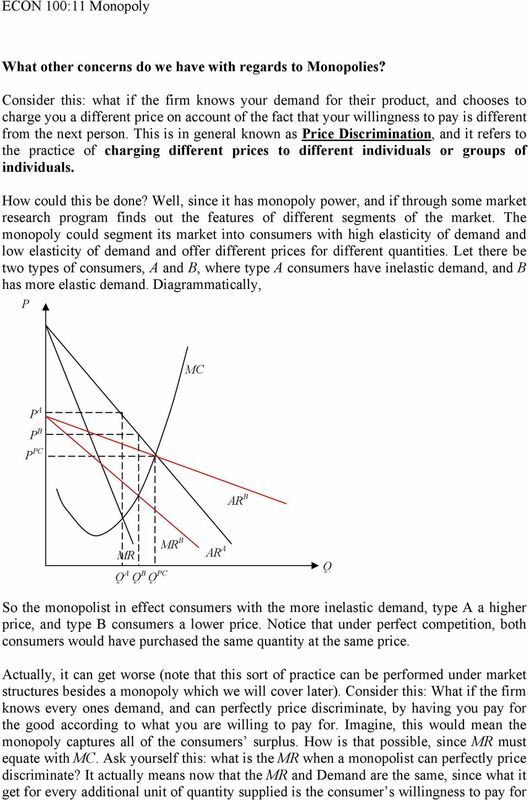 That is a monopolist charges a higher price and supplies a lower level of output. How is it they can do that? 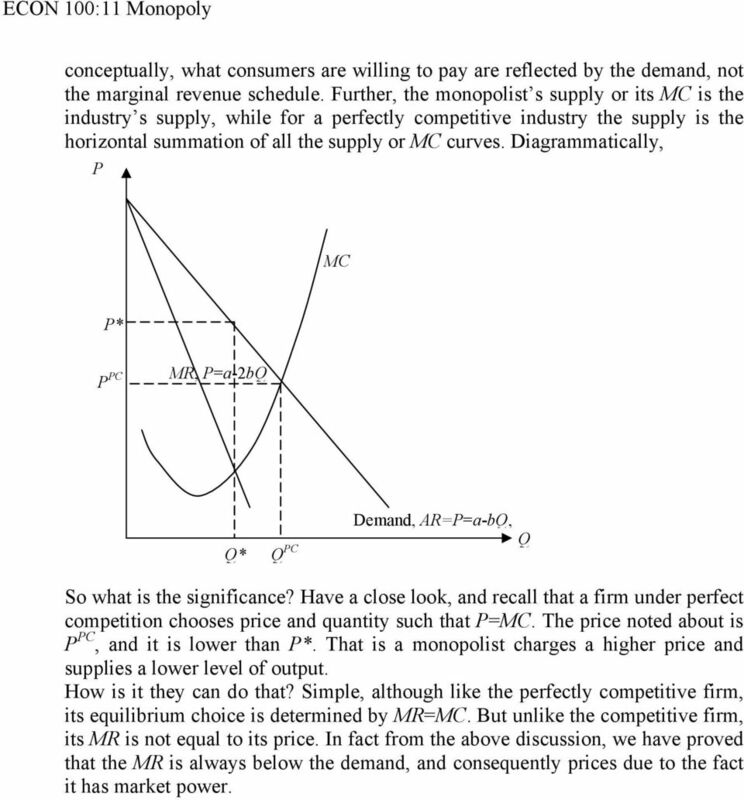 Simple, although like the perfectly competitive firm, its equilibrium choice is determined by MR=. But unlike the competitive firm, its MR is not equal to its price. In fact from the above discussion, we have proved that the MR is always below the demand, and consequently prices due to the fact it has market power. 7 1. 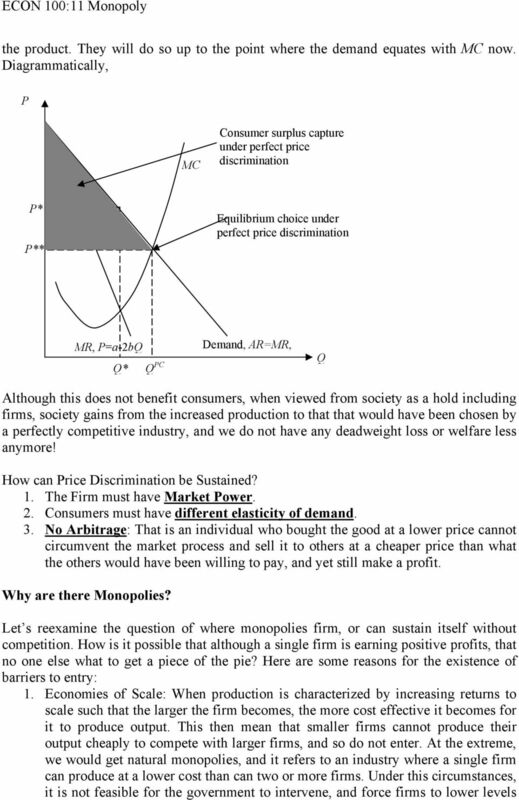 Because of market power, the monopolist captures the portion of consumer surplus, A, that would have accrued to consumers under perfect competition. 2. 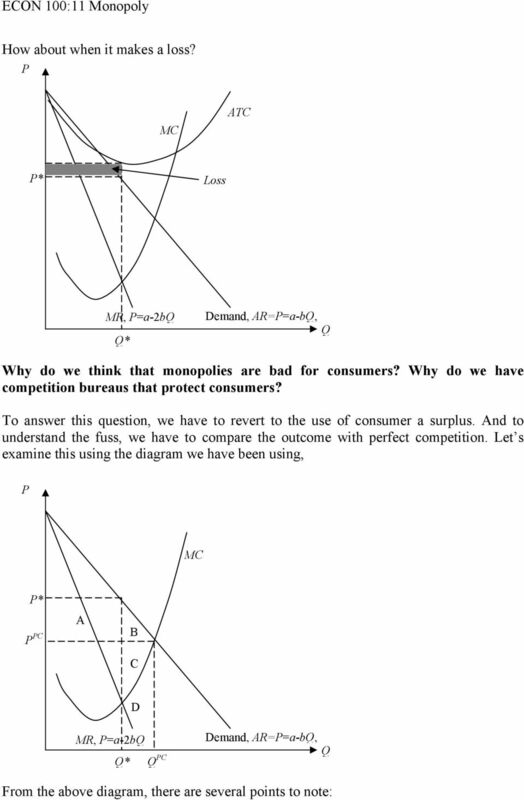 Because of the fact that a monopolist s MR is less than price, they chooses to produce less than the competitive level, and hence creates deadweight loss, B+C. This is commonly noted as welfare loss, since society would have benefited from this had production been increased to the competitive level. 3. Because of their choice, resources that could have been used to produce more goods are diverted to other uses in the form of D. This is not a loss to the society in general, unless the resources diverted are used for evil, and goods produced by the monopolist potentially benefits human kind! 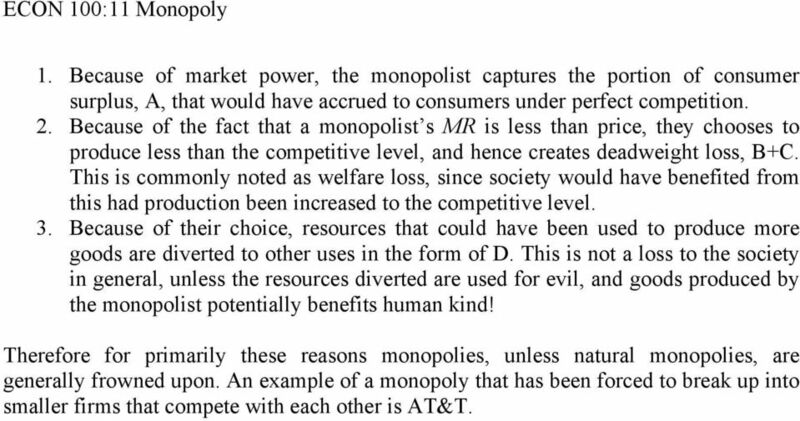 Therefore for primarily these reasons monopolies, unless natural monopolies, are generally frowned upon. An example of a monopoly that has been forced to break up into smaller firms that compete with each other is AT&T. 11 a patent which protects inventors of new innovations from having their designs or products copied. 4. Other Reasons: a. A monopoly may either legally or illegally possess factors of production or prevent others from obtaining these factors of production thereby inhibiting entry. b. Learning-By-Doing: A firm may also improve its processes just because it is the incumbent firm, thereby becoming very efficient at what they do, such that a new entrant may not be able to duplicate or match effectively. c. Anti-competitive Behavior: Example, Threats of rice War on entrant entering. What do we need for such a threat to be credible? Perfect Competition. We will use the second concept in here and your text, chapter 11. How Does A Perfectly Competitive Market Reach Long Run Equilibrium? Equilibrium of a firm under perfect competition in the short-run. A firm is under equilibrium at that point where it maximizes its profits.